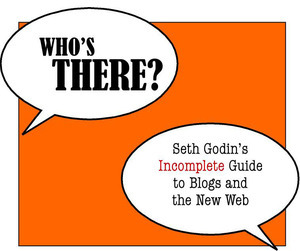 Just one sentence from Seth Godins ebook “Who’s There” about blogging. As usual he’s writing short, to the point and with a lot of truth. The book as 45 pages which will take you maybe 30-45 minutes to read. If you’re blogging, it will be more than worth this time. So every post on a “viral blog” should be designed to get you another RSS subscription. Every blog post should be designed to be important enough to get another blog to eagerly post a link or quote you or reprint the whole thing. Every blog post will be read because I want to, not because you want me to.